The Game Warden Training Center facility is now a 200-acre complex located in rural Hamilton County. The first cadet class graduated there in 2009. This page describes both the completed facilities and planned areas. This is still an active and growing training complex. The center had previously been located at the Texas A&M campus (1946-1975) and central Austin (1975-2008). 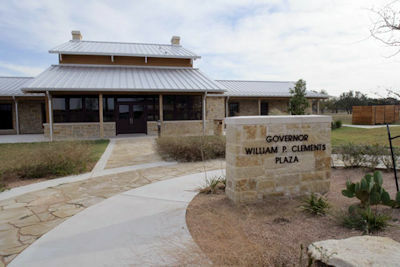 The Administration Building serves as the hub of the Texas Game Warden Training Center. It features a high-ceiling stone lobby area, office space, conference rooms, records storage area, and other essentials for the administration of a modern training facility. 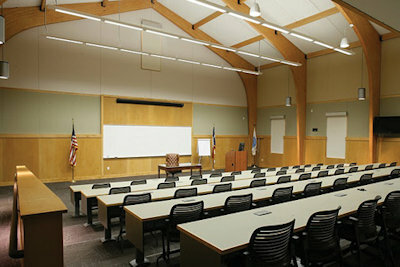 The classrooms in this facility are used for both cadet training and in-service classes for commissioned peace officers. State-of-the-art presentation technologies are included in the lecture hall, which seats up to 100 people. A computer area provides space for continuing education materials, in-service publications, cadet training, and online testing. This facility features the Firearms Training Simulator. It provides critical training for decision-making skills via instructor-controlled video scenarios. Storage is also there for the wide variety of wildlife mounts used for cadet training, continuing education, and public outreach. 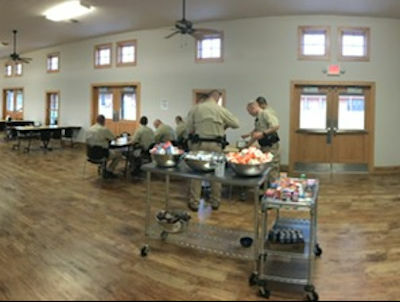 The completed hall accommodates 120 cadets, staff, and visitors of the Texas Game Warden Training Center. The recently remodeled kitchen is world-class, equipped with modern energy-efficient commercial appliances. 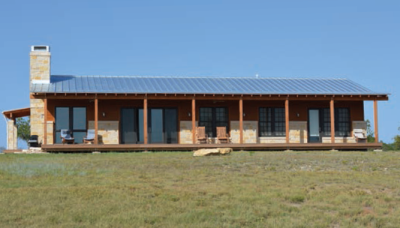 One on-site residence serves the housing needs of staff Director and their family permanently stationed at the Texas Game Warden Training Center. The firing range is a fundamental component of any law enforcement training program. 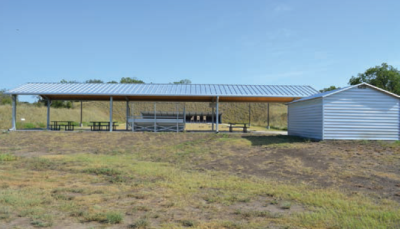 The Texas Game Warden Training Center range includes a 25-yard handgun range, 50-yard rifle range, and a covered area to shelter shooters and range equipment. 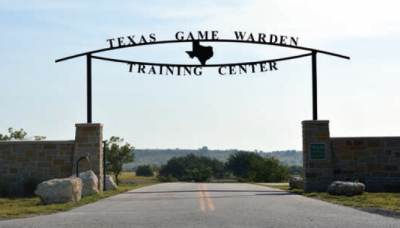 The entrance gate to the Texas Game Warden Training Center provides security for the center grounds. The structure is constructed of iron and stone and includes landscaping, lighting and an automatic gate with phone system interlink. Designed in the old Texas fort style, it is stylistically consistent with the other buildings in the complex. 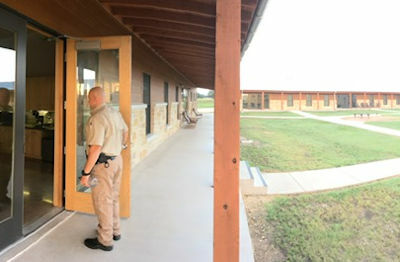 New cadet quarters have been built to meet the needs of trainees living at the Game Warden Training Center for over a six-month period. They use an efficient and sensible pod design, allowing groups of rooms to be heated/cooled only when necessary during a training period. Each pod also has laundry facilities for the cadets to utilize. 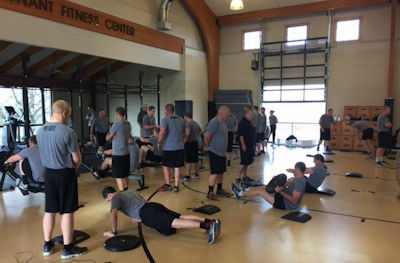 Physical conditioning is an essential component of cadet training. The gymnasium houses fitness and weight training equipment, a dedicated area for defensive tactics skills training, and recreation areas for team development. This facility includes showers and locker rooms for men and women. This facility supports the ongoing maintenance of the entire Game Warden Training Center, including its buildings, facilities, infrastructure and equipment. 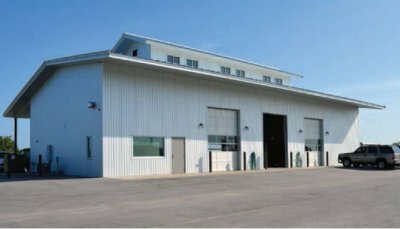 The building consists of a repair and fabrication shop for general maintenance needs, as well as auto and marine equipment repair. Vehicle and equipment storage is also a part of this structure. Physical conditioning is an essential component of the Texas Game Warden Training Center. The jogging track will be a standard 1/4-mile, multi-lane track. 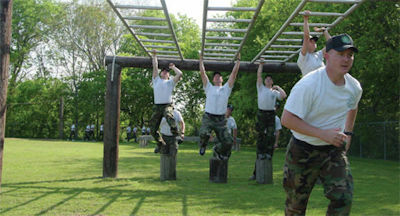 The obstacle course is designed to develop the leadership and technical skills needed by personnel to perform tasks in a realistic outdoor environment. It provides intensive physical training and builds teamwork. Approximate acreage: 5-6.